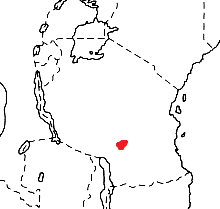 The Kilombero Weaver Ploceus burnieri is a range restricted species, endemic to the floodplain swamps along the Kilombero River in south-east Tanzania (see distribution map below from Birds of Africa). The adult male (left) is bright yellow with a dark brown mask which may appear black from a distance. Females (below) and non-breeding males are dull coloured, with a buff eye-stripe and two-toned bill. This species is the newest weaver species known to science, being described as recently as 1990 by Neil and Liz Baker. Their paper provided the only published breeding information for the species. The Kilombero Weaver feeds on seeds. It forages by moving up and down grass stems, feeding at flowering and fruiting grass heads. Flocks also forage on the ground. In December many birds in non-breeding plumage follow the Kilombero River downstream from the Ifakara ferry crossing. This species breeds in swamps fringed with tall Phragmites mauritianus, which is also used by Eastern Golden Weavers. The Kilombero Weaver breeds in loose colonies which often overhang water and may have a few nests or up to 20 or 30 nests, but solitary nests also occur. It is probably polygynous. The nest is woven by the male, as an oval, with a semi-elliptical side entrance facing downwards. The nest is built of grass leaves and strips and lined with broader grass leaves. The eggs (clutch 1-2) are uniform olive-brown to turquoise with light brown markings. Incubation and fledging periods are unknown. There is one PHOWN record for this species, and a news item described this mixed colony of Kilombero Weavers (phown 1961) with Yellow Weavers (phown 1960). Many more records are needed of this common, but highly localised species. Submit any weaver nest records to PHOWN (PHOtos of Weaver Nests) via the Virtual Museum upload site. Photo (left): female Kilombero Weaver at nest, from phown 1961 (see this record for a photo of the male at a nest).